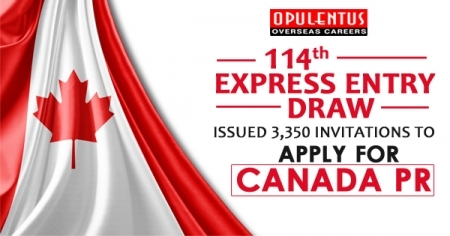 Canada has announced 3,350 invitations to appeal for Canada PR to Express Entry aspirants with scores as less as 451 in a current draw taken on Apr 3. The least score in present draw is one point lesser than the cut-off score in the earlier Express Entry invitation round held on Mar 20, which was 452. It was the 3rd successive draw in which the CRS cut-off score has dropped, a trend that may be associated with the regular two-week interval within the draws. The tie-break rule utilized in the Apr 3 draw was fixed on Jan 9, 2019, at 07:35:09 UTC. It indicates that all applicants with a CRS score over 451, as well as those applicants with scores equal to 451 who entered their profile in the pool of Express Entry before this date and time, got an ITA in this round of invitation. The Federal Express Entry system controls the pool of applicants for three primary Candian economic immigration programs — Federal Skilled Trades Class, Canadian Experience Class, and Federal Skilled Worker Class. Qualified candidates for every class are allocated a score beneath the Comprehensive Ranking System (C.R.S) and are accessed into the Federal Express Entry pool, where they will be given rank respectively. A fixed number of the best-ranked applicants have then announced an Invitation to Apply for Canadian PR by usual draws from the pool. The 3,350 ITAs announced in the Apr 3 draw bring the complete invitations issued in the year 2019 to 24,550. Canada is presently ahead of the pace it had fixed in the year 2018, which completed with a record of 89,800 ITAs announced. A look at the results of ITA by Apr 3 for both years reveals 2019 is leading than 2018 by 7,050 ITAs. This was the 5th continuous draw in which IRCC announced 3,350 ITAs. Draw sizes, however, may grow in the approaching weeks and months and Higher admissions goals of Canada for 2019 and 2020 for the 03 economic immigration classes attended by the Express Entry system.